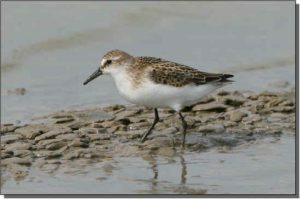 Description: Semipalmated Sandpipers are sparrow-sized with black legs and a short, straight bill. In nonbreeding plumage, they are plain gray-brown above with fine dark streaks across the breast, a brown loral stripe and white supercilium. The breeding plumage shows more mottling with dark brown and black above and a few dark streaks on the sides. Similar Species: Semipalmated Sandpipers can be difficult to distinguish from other small sandpipers. Their wing tips do not extend past the tail, which distinguishes them from White-rumped and Baird’s sandpipers. Western Sandpiper bills are usually longer, thinner and have a drooped tip. However, the bills of male Western and female Semipalmated sandpipers can overlap in length. The Semipalmated Sandpiper’s black legs and larger size distinguish it from the Least Sandpiper. Smaller size and black legs distinguish it from the Pectoral Sandpiper. Comments: Semipalmated Sandpipers breed on the low arctic tundra and winter on mudflats, sandy beaches and freshwater lakes and ponds of Suriname, Guyana and northern Brazil. They are highly gregarious and flocks can be large.